My mother-in-law’s birthday fell on Mother’s Day this year, and we all wanted it to be an extra special weekend filled with good company, food, and cheer. Despite the initial feeling of relief I had when I heard the meal was already planned and set to go, I ended up playing an active role in the menu preparation and got pretty excited when I landed on this idea and had a good time coming up with some fun, fresh, and healthy dishes for a three-course meal. Our culinary team extraordinaire, consisting of myself and my two “sous-chefs” (my husband and father-in-law), went with a total opposite direction from the former menu of churrasco (Brazilian meat BBQ, which is yummy as well!) and pulled this together in an afternoon, requiring creativity and inspiration in the execution to present a beautiful, celebratory, and flavorful Mother’s Day meal. It’s gotten much warmer in the Boston-area lately, warm enough to grill often, in fact! Sometimes it gets too hot to cook inside, so grilling is a welcome alternative if you have the option to grill. It was also a little too warm this past weekend to eat a very energy dense meal. But, even without a meat-heavy meal of churrasco, we still incorporated some delicious grilled meats. 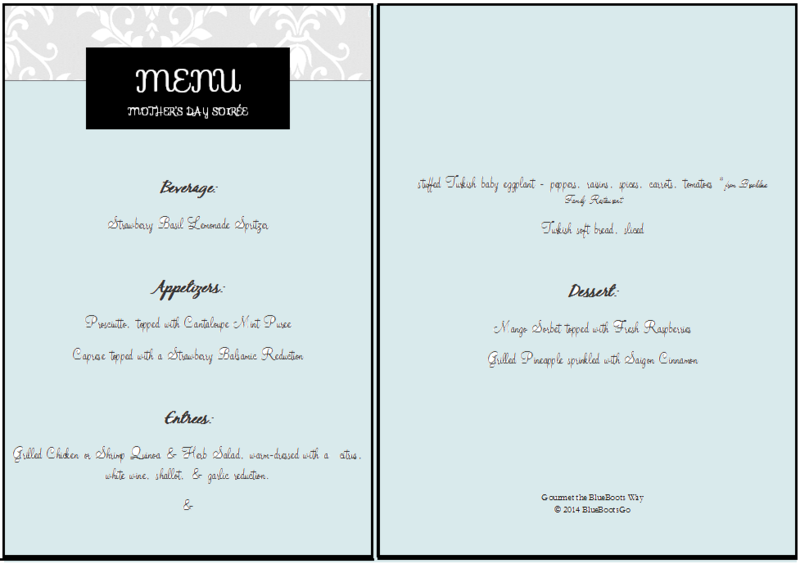 I’m happy to share the MENU and also some helpful recipes that I’ve dashed down here! Everything here except for the Turkish baby eggplant and bread- which we picked up from a restaurant because it’s too good all on its own – are recipes right here from BlueBootsGo. What I really love about this menu is that it is cohesive and light, and a lot of the ingredients are found in multiple dishes in the different courses. *Except for the bread, this entire meal is gluten-free as well if any of you have gluten concerns. I hope all the readers who are Mothers enjoyed their special day of appreciation. Enjoy these recipes! 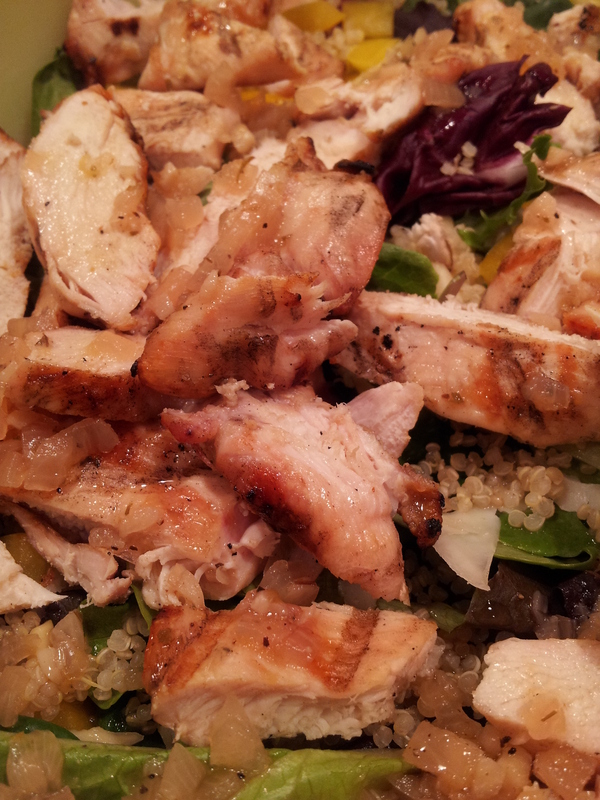 Grilled Chicken or Shrimp Quinoa & Herb Salad, warm-dressed with a citrus, white wine, shallot, & garlic reduction. Your guests are probably going to be thirsty and want a snack while they wait for the amazing soiree meal. To prepare the Strawberry Basil Lemonade Spritzer, you just need a couple of simple ingredients. Wash, remove leaves of, and prep 1 cup of fresh strawberries. Strip leaves from basil, approximately three sprigs worth of basil leaves. Blend in a blender. If you don’t have time to fresh-squeeze a bunch of lemons, it is just fine to add organic lemonade. 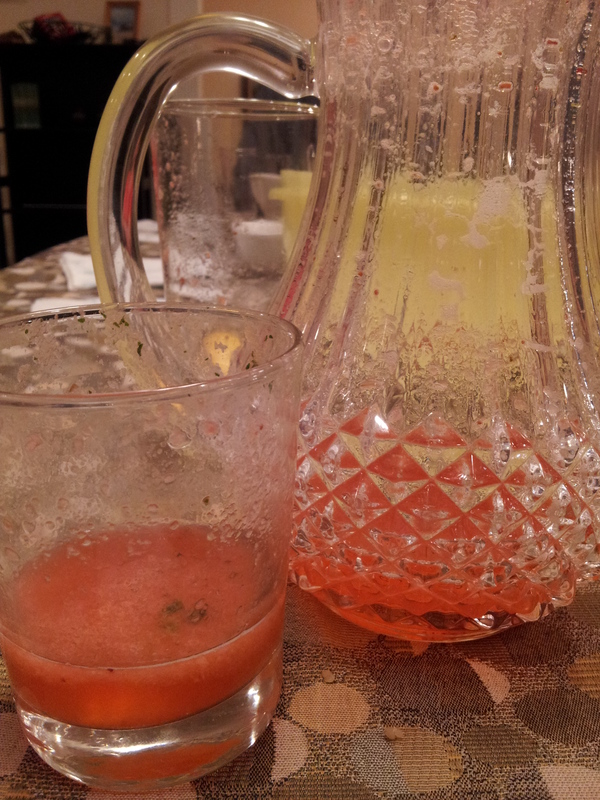 Add twice as much lemonade to the strawberry basil concentrate you just blended. Mix. Pulse a few times and then chill for an hour, so the bubbles from blending settle. Add some sparkling lime seltzer to top off the pitcher. Now that your guests will have something refreshing to sip on while they catch up, let’s begin by preparing the appetizers. 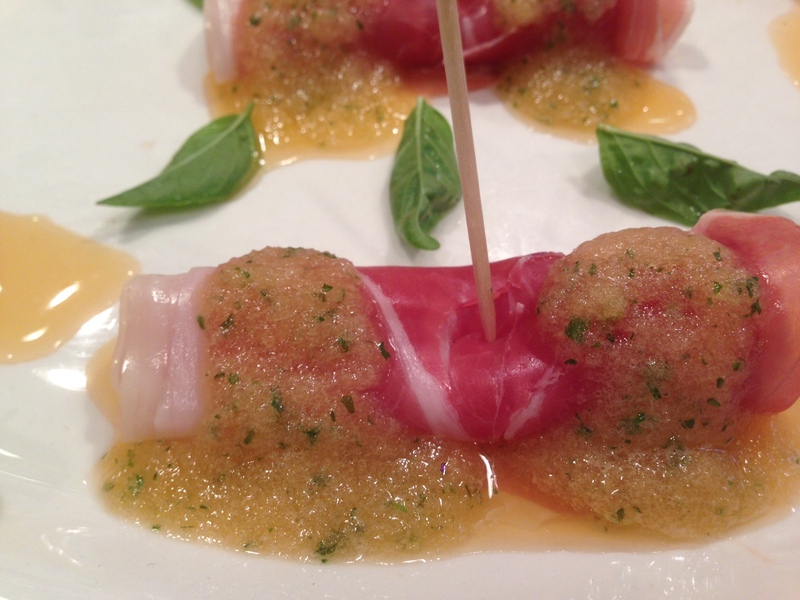 The first appetizer to prep is the Prosciutto topped with Cantaloupe and Mint Puree. 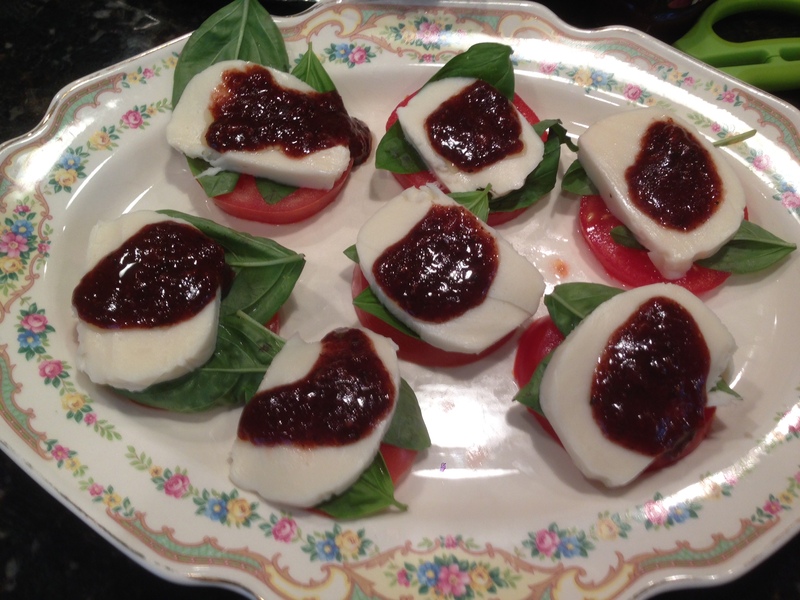 This appetizer screams fresh and summer, and while it is gourmet, it is SO easy to execute at home. 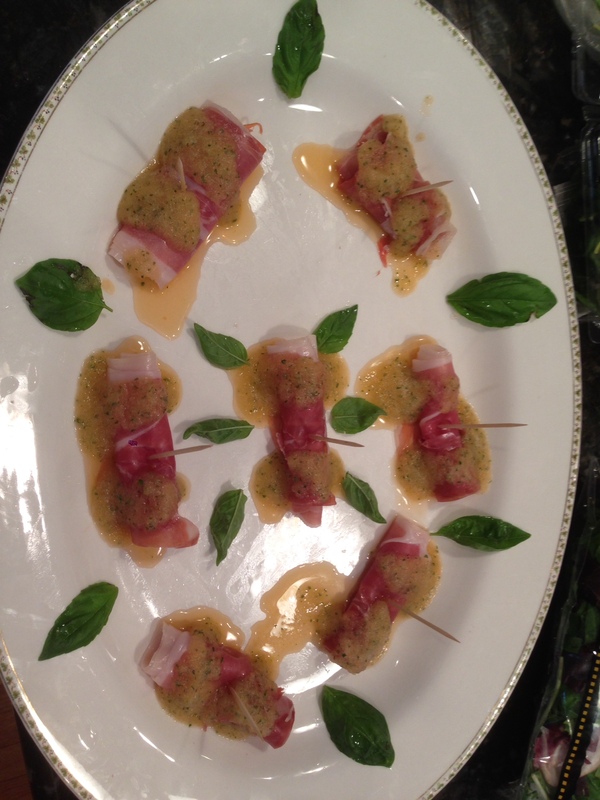 All you need is a package of sliced prosciutto, one small, ripe cantaloupe, and leaves from two full sprigs of mint. Peel and slice the cantaloupe into chunks. Wash and prep the mint. Drop into a blender and blend until pureed. You should be able to smell the sweetness of the cantaloupe and a bright mint scent when you check to see if the ratio is right between melon and mint. Chill for about 30 minutes, or as long as you can. When ready to serve, roll the prosciutto slices individually onto a platter. 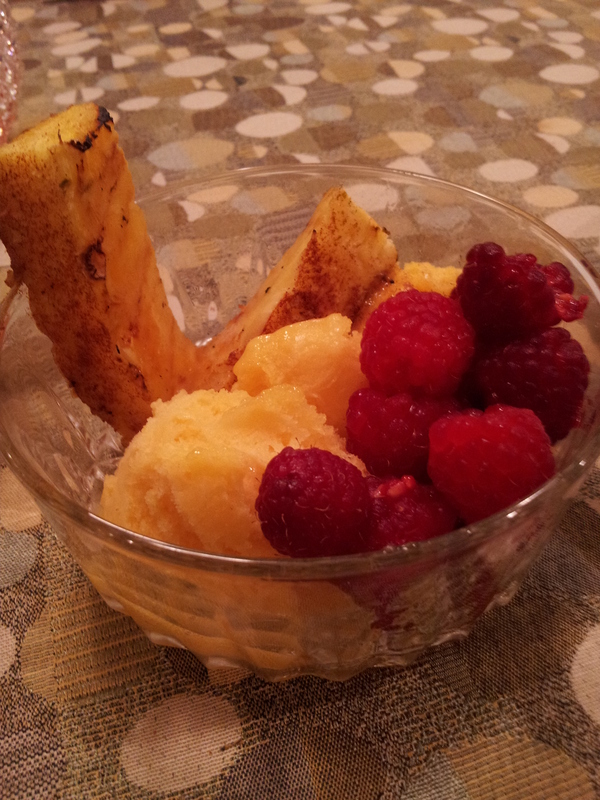 Drizzle with Cantaloupe and Mint Puree. All done! 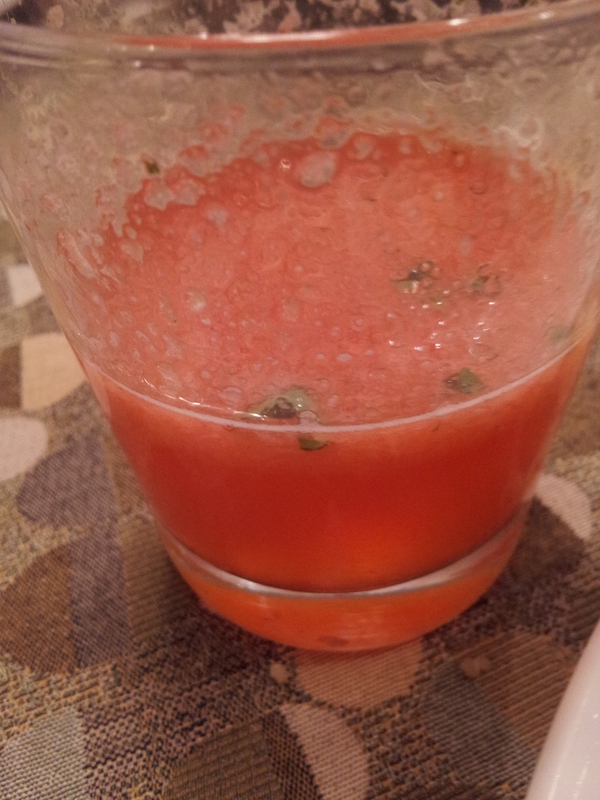 What’s wonderful is that this Cantaloupe and Mint Puree is just as refreshing as a drink too – my 15 month-old nephew tried and approved it (many glassfuls), and would have had it instead of his dinner if Mom hadn’t intervened! Slice a log of mozzarella. Slice one tomato on the vine. Wash and prep basil. Lay the tomato on a platter first, followed by two basil leaves, and one slice of mozzarella. Strawberry Balsamic Reduction – super easy and AMAZING flavors! Wash and remove the leaves from ~8 strawberries. Chop them in a small food processor until pulpy and no large chunks remain. In a saucepan, gently heat 1/4 cup of balsamic vinegar. I happened to not have any balsamic vinegar on hand, so I improvised successfully with a dark balsamic vinaigrette dressing that didn’t have so many Italian seasonings in it. Add the strawberries and keep on medium heat while stirring. Eventually, the sauce should thicken in about 10 minutes. Lower the heat until a nice thick reduction has evolved in the saucepan. Cool on the stovetop until ready to dress and serve the Caprese. Now, we can move onto preparing the Entree Salad. 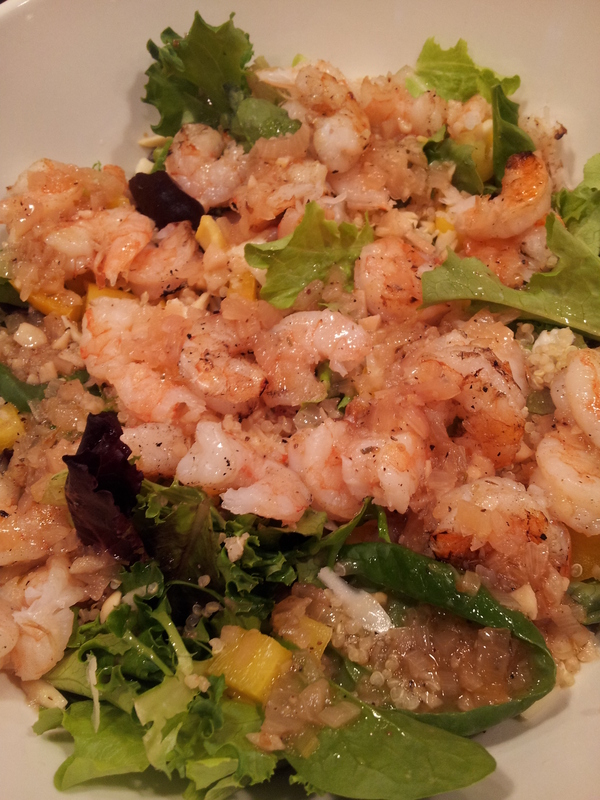 The Warm White Wine and Citrus Salad Dressing is the perfect accompaniment for the grilled shrimp. 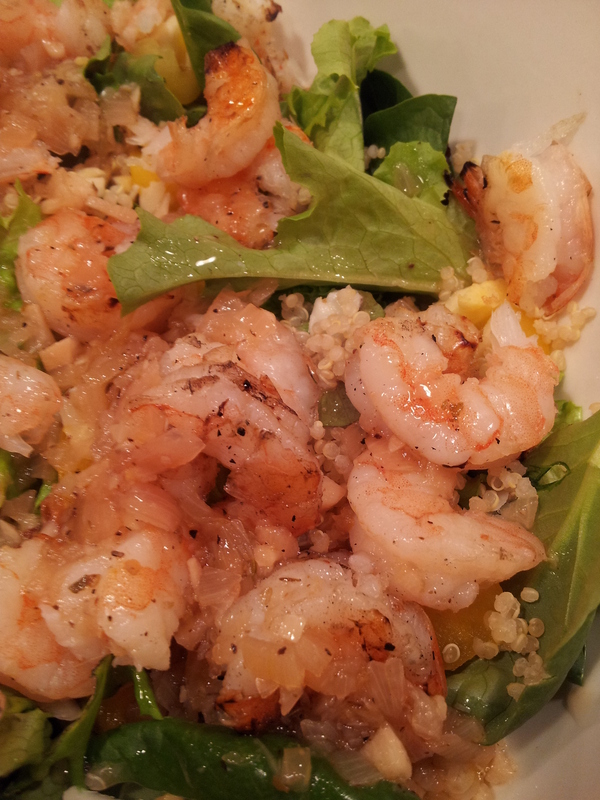 I’m really not much of a shrimp person – I have developed an intense love/hate relationship with it over the past 5 years or so – but even I can tell that this dressing brings out the best in shrimp. Prep the quinoa – you need only about 1 cup of cooked quinoa, although if you make more, you will have some leftovers for the week! An easy trick is to do this in the rice cooker, and use low-sodium chicken broth for a nice flavor. 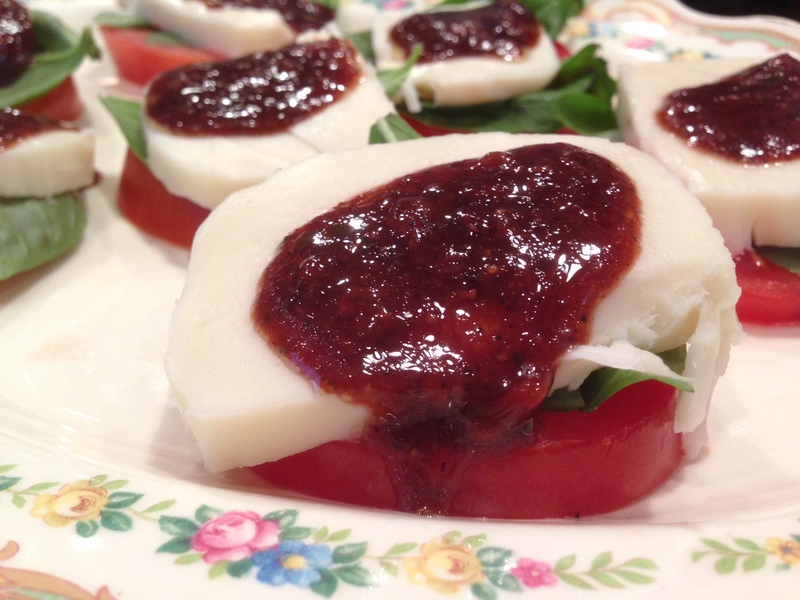 Take a peeler to a wedge of Asiago cheese and slice up some to top the salad. 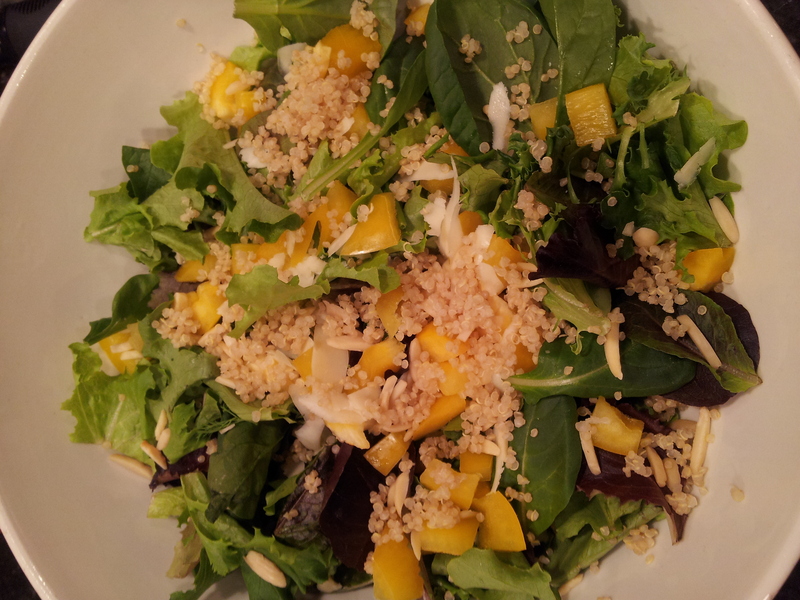 The flavor of fresh Asiago works beautifully with a light, lemon-based salad. All these go on top of the Salad. Let’s prepare the dressing for the salad. Now, I love the idea of making my own salad dressing. Do you know what I love more? Not making a marinade for the chicken AND a dressing for the salad, but having ONE lovely sauce for the meats become a warm, truly flavorful dressing for the crisp, cold salad. Mmmmm! Finely chop 2 shallots and 3 cloves of garlic and put in a saucepan. Add in 1 cup of white wine on medium-high heat until boiling. Reduce heat slightly. Stir and monitor for approximately 5-8 minutes or until almost no liquid remains. Add in 1 cup of white wine and repeat. Season with 2 tsp of salt, 1/4 tsp oregano. Squeeze 1 lemon into the saucepan. Zest 1 lemon into the saucepan as well. After the second reduction, add in 2/3 cup of white wine and simmer on low heat until ready to dress the salad. Next, add the hot-of-the-grill meats. Grill 4 chicken breasts and approximately 24 whole shrimps, with the skins on. 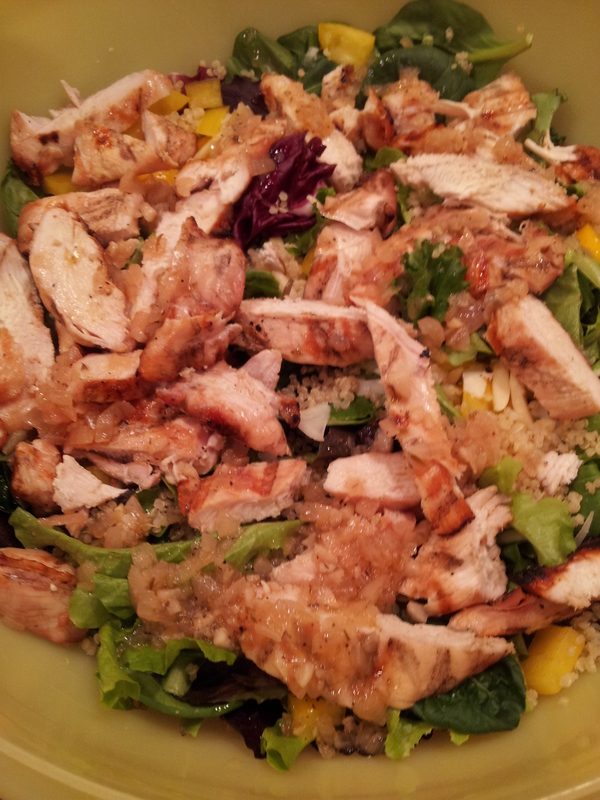 Peel the shrimp and slice the chicken into strips to top the salad. You can do this in the last 20 or so minutes before you’re ready to serve the meal. The Dessert is just fruits all around. They are a celebration of summer coming soon! Hope you enjoyed Gourmet the BlueBoots Way ;)! 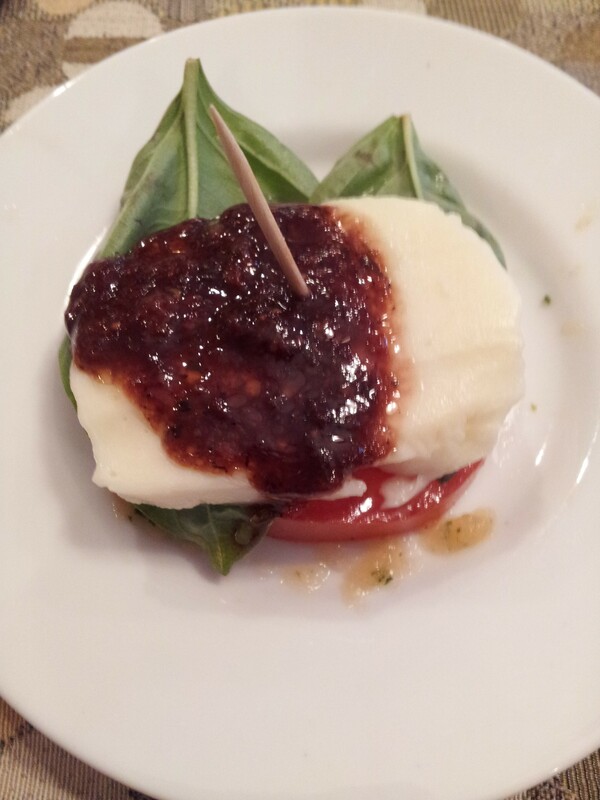 Tags: awesome sauces, bluebootsgo, caprese, celebrate, gluten free, gourmet, gourmet the blueboots way, grilled fruit, grilled pineapple, grilled summer salads, mother's day, mother's day brunch, perfectly dressed shrimp salad, recipes, strawberry balsamic reduction on caprese, strawberry basil lemonade recipe. Bookmark the permalink. These dishes were amazing. I would love to try the mint-cantaloupe as a drink this summer having chilled it in the fridge. Everything looks so colorful and speaks summertime! Thanks! That’s something to look forward to this summer – a cool, refreshing melon and mint combination will be a must. Wow, looks amazing! And like lots of labor and love went into it. What a beautiful meal. Thank you for commenting! Welcome 🙂 Yay!